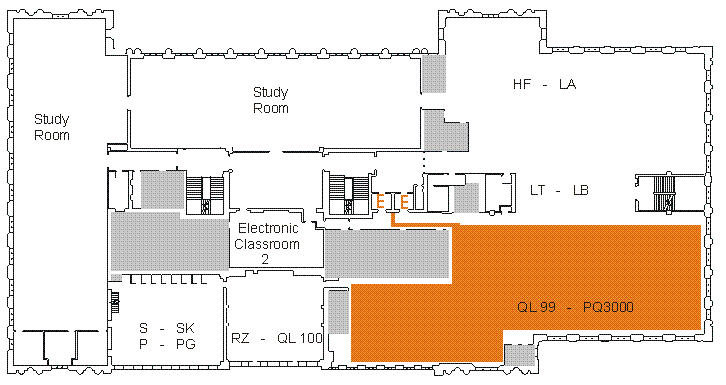 Search the call number of a book at Ellis Library, and receive a map and written directions to the book's location. The location tells you which library or part of the library where the book is located. There are many different libraries on campus (Math, Journalism, etc. ), and each library has its own location code. There are also special departments with their own codes, like Recorded Sound in Ellis. The call number tells you exactly where the book is on the shelf. Books are arranged in the library by subject, and every book has it's own specific place on the shelf. Write this number down or use the "text call number" feature to be able to find the book on the shelf. The status tells you if the book is currently on the shelf and available to check out. For example, if a book is, "NOT CHECKED OUT," that means it is on the shelf and available. If the status is "DUE," the book is currently checked out until the date listed. The picture below shows where to find (1) location, (2) call number, and (3) status when searching MERLIIN and when using Search & Find.